Since 1990, the Toronto Stock Exchange has featured a nifty little investment vehicle called an exchange-traded fund or ETF. Combining the (theoretical) safety of a mutual fund with the everyman tradability of a stock, the idea proved to be a popular one. With good reason too. It was like the market equivalent of a multivitamin. Instead of having to purchase and keep up with 12 separate supplements, investors could just swallow one pill while reaping a dozen benefits. Or consider the more common ETF analogy that compares it to a basket. Because that's really what it is: a set and sealed container holding a defined group of stocks, bonds, or other securities, that then trades as one entity. This makes for easier buying in practice and safer buying in theory (and mostly in practice). Investors can buy into an array of offerings from a specific sector with just one purchase, spreading out their specific-sector-related risk as they do. Any one slice of the economy can, has, and will again suffer its setbacks as a whole. And each working part within that slice can, has, and will again take its own distinct tumbles thanks to an unbelievably long list of negative influences. Changing trends. Bad press. Bad decisions. Bad luck. Those possibilities and so much more make individual investment selection complex at best and neuroses-inducing at worst. ETFs can't save investors from economic or sector failures, mind you. But they can insulate them from the poor placement of a single company or entity. While shareholders of ABC Corp. are set to suffer when its stock plummets, shareholders of an ETF holding ABC Corp. and a few dozen other companies might just see a blip on their financial radar. Seeing how profitable that concept was (and continues to be), the United States followed Canada's precedent in 1991. Europe adopted it in 1999, and the investment world has never been the same since, with everyone seeming to want in on the action from there. By 2012, there were so many ETFs that USA Today was even asking "when are there too many?" As it turned out though, the answer was "not enough," considering how the number just continued to grow. By April of last year, there were more than 1,800 ETFs available. Today, there are exchange-traded funds that allow people to invest in the entire S&P 500 in one easy asset… ETFs that track gold's performance… ones that include nothing but technology stocks… and those that focus on emerging markets alone. 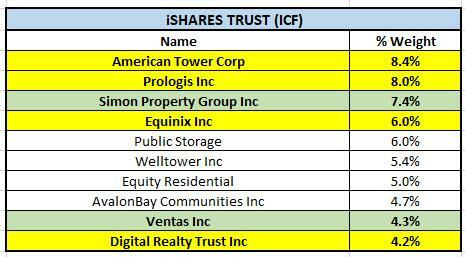 And, yes, there are real estate investment trust ETFs as well. However, as with any other type of investment, ETFs, in general, and REIT ETFs, in particular, are not all created alike. Some are worthwhile. Some are very worthwhile, and some are the exact opposite. Let's explore these REIT ETFs in further detail. 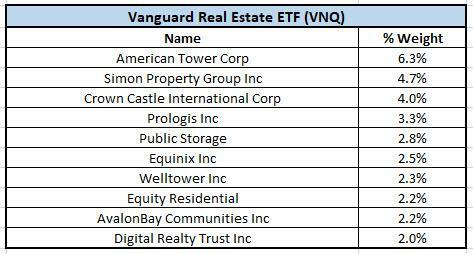 When you look closer at the list of REIT ETFs you can see one big whale, known as Vanguard Real Estate ETF (VNQ). 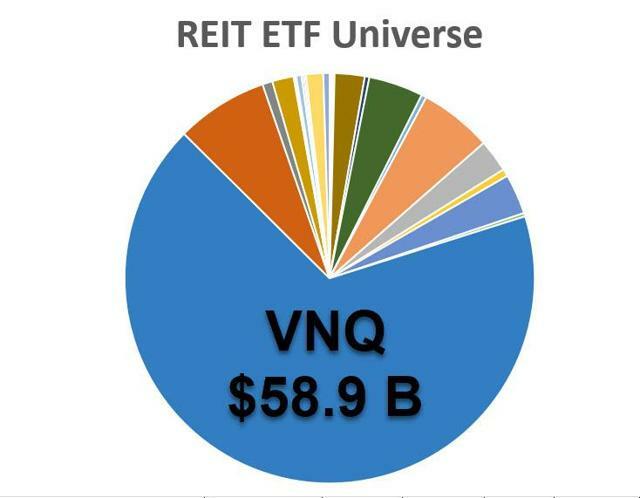 You may recall an article last year where I explained, "VNQ changed its name from the Vanguard REIT ETF to the Vanguard Real Estate ETF (as of February 2, 2018). In addition to a name change, the ETF also changed its index, dropping the MSCI US REIT Index for the MSCI US IMI Real Estate 25/50 Transition Index." The reason for the change was to expand the scope of VNQ's coverage beyond just REITs, to include other types of real estate companies, such as those involved in services and development, as well as other REITs. Examples of companies inside the index Vanguard seeks to track (and in peer REIT funds) include real estate services companies CBRE Group (CBRE) and Jones Lang LaSalle (JLL), real estate developer The Howard Hughes Corp. (HHC), and specialty REITs Lamar Advertising (LAMR), and Rayonier (RYN). The change also aligns the Vanguard REIT Index with the updated GICS (Global Industry Classification Standard) methodology for classifying global market sectors used by S&P and MSCI. Benchmark Investments is an investment intelligence firm based in the Flatiron District in NYC. Benchmark partnered with Pacer ETFs to launch real estate exchange-traded funds that divide the real estate market into seven distinct and investable sectors. In May 2018, they launched the first three funds they believe have the best secular tailwinds behind them to thrive in a rising rate environment. The sector ETFs are two core property types: industrial and retail, and one non-core property type: data centers & telecom. They are a good way to play the real estate market. The U.S. economy depends on an increasingly sophisticated foundation of data centers, wireless towers and fiber optic networks that process critical data and information for consumers and businesses alike. SRVR is a pure-play way to invest in the data centers, cellphone towers, and communications infrastructure REITs and C-corps that are set to capitalize on the buildout of 5G, online commerce, artificial intelligence, virtual reality, augmented reality, blockchain, and Internet of Things. Most other broad-based REITs only include four data centers, while SRVR has ten. 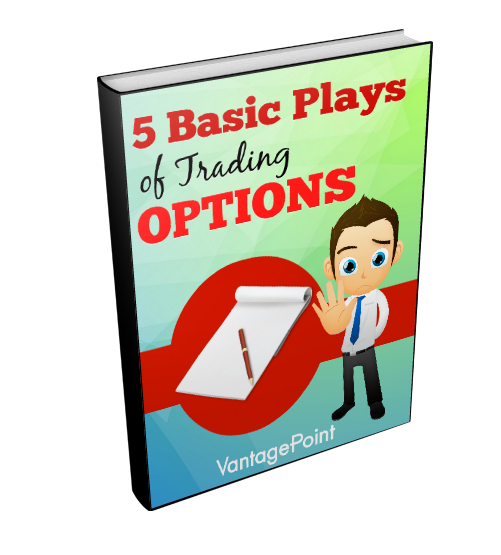 It's a low volatility technology play and is a great way to 'de-FANG' portfolios. 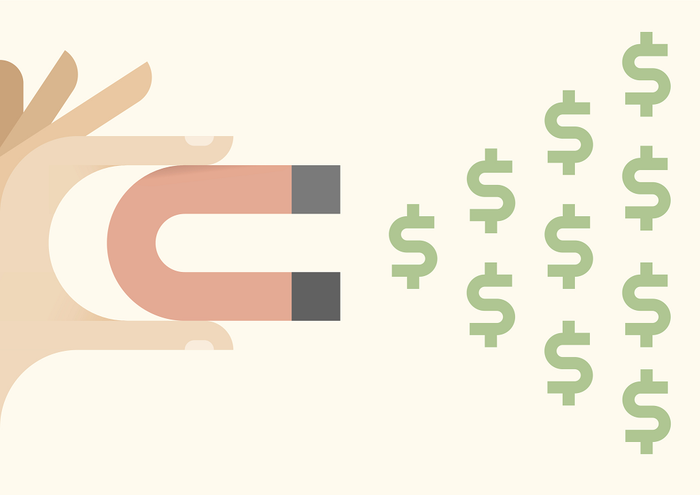 INDS is uniquely positioned to capitalize on the explosive e-commerce growth that accounts for less than 10% of overall sales. As e-commerce sales continue to grow 16% per annum, online retailers generally achieve fast shipping by investing in real estate in the form of warehouses rather than stores. INDS constituents provide the engine of e-commerce growth as they are leaders in providing high-quality, productivity-enhancing industrial properties and they own and manage best-in-class warehouse and distribution facilities. Rents in the industrial property sector have been up more than 30% the past few years leading to most of the constituent's portfolio rents being 15%-20% below market levels. This leads to a meaningful built-in net operating income growth potential over the next several years. RTL invests in commercial retail real estate REITs that have augmented their properties to service experiences and activities with more food-and-beverage, health-and-fitness, essential services, and entertainment offerings. The storefront is the gateway for online sales with commercial real estate serving as an ideal medium for connecting with established shoppers and attracting new ones. The fusion of retail and entertainment has increasingly been taken on in the digital age making tenants utilize the experiential concept to compel consumers to visit their stores. "Anytime a person uses their phone to buy an item online, they are using the real estate backbone from the cell phone towers to the data centers to the warehouse, or even, to the storefront," said Kevin Kelly, CEO of Benchmark Investments. 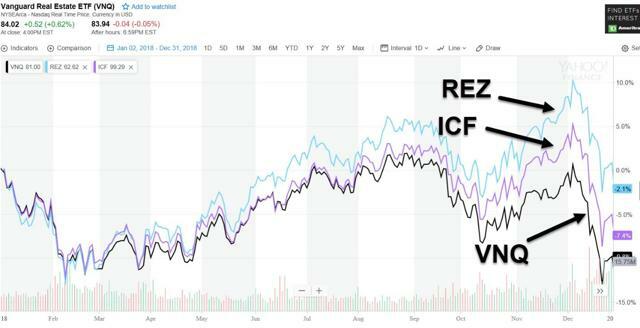 So, there you have it, REIT ETF investors either can own the big whale, VNQ, or the little guppies like SRVR, INDS, or TRL, or anywhere in between. 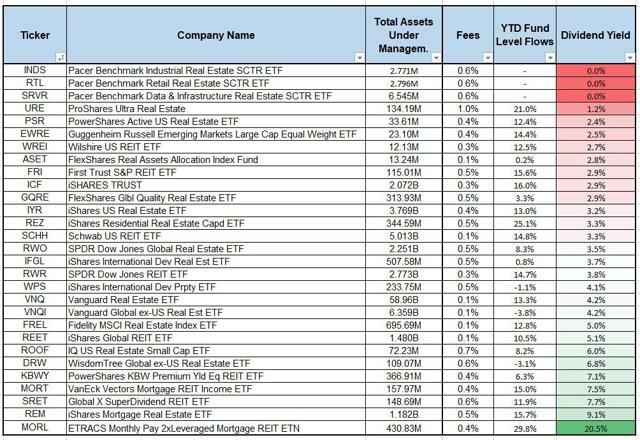 As you can see, VNQ returned -6.0%, not even in the top five: First Trust S&P REIT ETF (FRI) returned -4.3%, Schwab US REIT ETF (SCHH) returned -4.2%, iShares Mortgage Real Estate ETF (REM) returned -3.0%, iShares Cohen & Steers Real Estate ETF (ICF) returned -2.5%, and iShares Residential Real Estate ETF (REZ) returned +3.9%. As you can see below, here are the top 10 holdings for REZ, which include Public Storage (PSA), Welltower (WELL), AvalonBay (AVB), Equity Residential (EQR), Ventas, Inc. (VTR), Essex Property (ESS), HCP Inc. (HCP), Extra Space (EXR), UDR Inc. (UDR), and Mid-America (MAA). 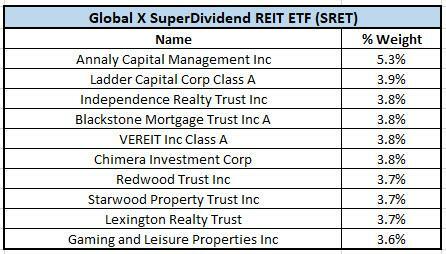 One of the more popular REIT ETF names on Seeking Alpha is Global X SuperDividend REIT ETF (SRET), which ranks among the highest yielding REITs globally, as determined by Solactive AG, the provider of the underlying index. The fund is non-diversified and owns a number of REITs that I own, such as Iron Mountain (IRM) and STAG Industrial (STAG). The dividend yield is a whopping 7.7%, but this fund returned -5.5% in 2018. Here's a snapshot of SRET's top 10 holdings (note: Ladder, Blackstone, and Starwood are included in the top 10 and they are also participants in our commercial mortgage REIT Index referred to as 'BLAST'). As many of you know, in addition to writing free articles here on Seeking Alpha, I also actively manage a number of REIT portfolios as part of a subscription-based platform. My very first portfolio, called the Durable Income Portfolio, was created over five years ago and has become my own personal REIT portfolio. Much like an ETF, I opted to build a diversified basket of REITs so there's ample diversification, and my strategy is to invest in primarily dividend growth stocks, utilizing the margin of safety concept. Each pick is screened based on a number of durability attributes, and spec positions are limited to just 1%. The maximum concentration level is 5% per REIT, but there are exceptions that sometimes warrant a higher stake (must be a strong buy at the time). Keep in mind, the Durable Income Portfolio is a newsletter portfolio, but it's also my personal portfolio, so you could say that I have ample skin in the game. Nonetheless, I wanted to provide you with a snapshot of the 2018 performance of the Durable Income Portfolio, which returned 2.0%. The top performers were Omega Healthcare Investors (OHI) +37.3%, Ladder Capital (LADR) +25.7%, Realty Income (O) +15.7%, and Store Capital (STOR) +14.5%. Also, I created a REIT Index, referred to as the DAVOS Index, which includes many of the most popular equity REITs: Digital Realty (DLR), American Tower (AMT), Ventas Inc. (VTR), Realty Income, and Simon Property (SPG). In 2018, the DAVOS returned 6.52%. Keep in mind, comparing the Durable Income Portfolio with these REIT ETFs is not really an "apples to apples" comparison, because an ETF is designed to produce mediocre results, and as a REIT analyst, my portfolio should outperform the basket of good, bad, and ugly. It's 2019… Who Wants To Sleep Well at Night? The top 2019 performer so far, is ProShares Ultra Real Estate (URE)which corresponds to two times (2x) the daily performance of the Dow Jones U.S. Real EstateSM Index. The fund invests in financial instruments that ProShare Advisors believes, in combination, should produce daily returns consistent with the fund's investment objective. The index seeks to measure the performance of certain companies in the real estate sector of the U.S. equity market. Component companies include, among others, real estate holding and development and real estate services companies and REITs. Another Seeking Alpha favorite is UBS ETRACS Monthly Pay 2xLeveraged Mortgage REIT ETN (MORL). This index tracks the overall performance of publicly traded mortgage REITs that derive at least 50% of their revenues from mortgage-related activities. The securities are senior unsecured debt securities issued by UBS AG (UBS). The securities provide a monthly compounded two times leveraged long exposure to the performance of the Index, reduced by the Accrued Fees. Don't get too mesmerized with URE ($134 mm in assets), or MORL (yielding a nose bleed 20.5%), which are considered extremely volatile, and warrant a good bit of hands-on expertise. Our best REIT ETF pick for Average Joe or Average Jane is iShares Cohen & Steers REIT ETF (ICF), which is loaded with high growth REITs (in yellow), and two of my strong buy picks (in green). 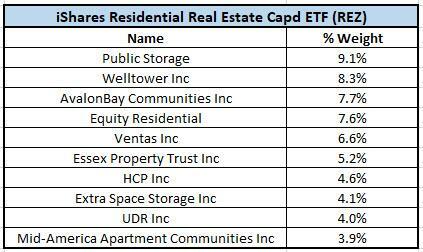 In closing, please let me know if you'd like to add other REIT ETFs to our research list for our tracking. Also, stay tuned because one of the things on my "to do" list in 2019 is to launch my very own REIT ETF Index… and my number one objective will be not to mimic the competition, but to help investors sleep well at night. Never forget Rule #1: Protect your hard-earned principal at all costs.